Avril Lavigne is a Canadian-French singer and songwriter. 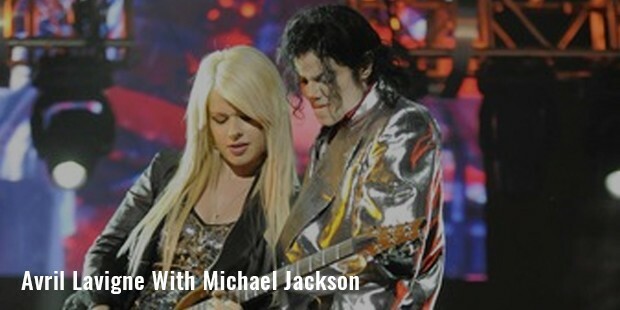 She appeared on stage for the first time at the age of 15 with Shania Twain. By the age of 16 she signed two album recording contracts with Arista Records. Avril entered the music industry when was only 17 years old with her debut album “Let Go.” Her debut album sold 7 million copies in the United States alone. She was born in Ontario and grew up in Greater Napanee. She started to sing when she was only two years old. Her father gifted her microphone, drum kit, keyboard and several guitars to support her singing. She converted their basement into studio where Avril sang to herself or her family members. At the age of 14 Avril started to take Karaoke sessions. She even performed at country fairs and started writing her own songs. 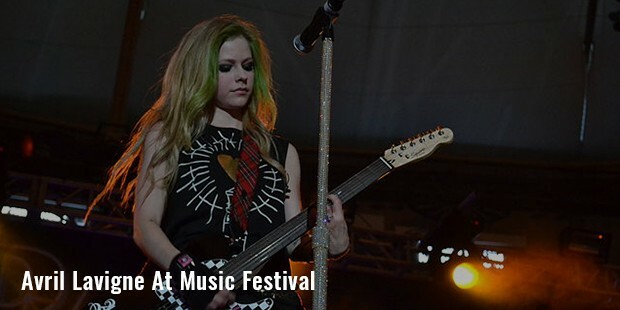 Avril staged for the first time after winning a radio contest and performed with Shania Twain in Ottawa. During the performance she was spotted by a folk singer and invited her to contribute vocals to “Touch the Sky”, “Temple of Life” and “Two Rivers.” In 1999, Cliff Fabri spotted Avril and sent out VHS tapes of her performances at home. She was visited by several executives but nothing to success. Later Mark Jowett received a copy of Avril’s basement performance and arranged to work for Peter Zizzo. In 2000, the head of Arista Records heard her sing in a studio and was impressed and signed her. Avril’s first album was “Let Go” was recorded by 2002 and hit the Billboard 200 on the spot 2. By the end of 2002, the album was certified four-times platinum and made her the best selling female artist. Avril’s next album “Under My Skin” released in 2004 and again topped the charts of Australia, Canada, Japan, UK and the US. Avril proved her potential as a lyricist and a singer with the two albums she released. She got her breakthrough from the single “Complicated.” Her third album “The Best Damn Thing” released in 2007 and became the number 1 album in UK Albums Chart. She released her fourth album in 2011 titled “Goodbye Lullaby” which was a hit in Japan and Australia. She lent her voice for the animated film “Over The Hedge” to the character Heather. She appeared in movies but chose rather cautiously starting with acceptance of small roles. Her debut “The Flock” was released at the American box-office but came to the foreign market only in late 2007. Avril owns a clothing line “Abbey Dawn.” The collection is titled after Avril’s childhood name and is designed by her. 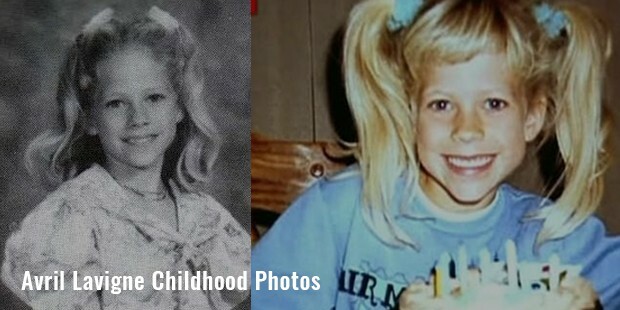 Avril is always known for her tomboyish image in the public eye. She preferred baggy pants, tank tops and skater shoes. Avril’s style has a more gothic touch to her image which she started to carry from her second album. In the recent Avril has changed a lot when it comes to fashion. She wore feminine outfits like tight jeans and heels. She defines her new style as grown. 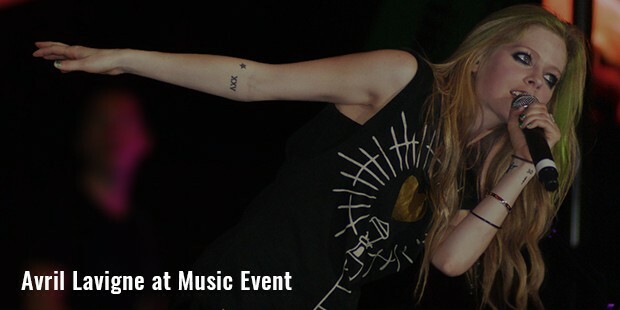 Avril’s love for tattoo’s can be seen on her body. She started dating Deryck Whibley, when she was 19 years old. She even got a tattoo with his name on her wrist. The couple married in 2006. They separated after four years of marriage in 2010. 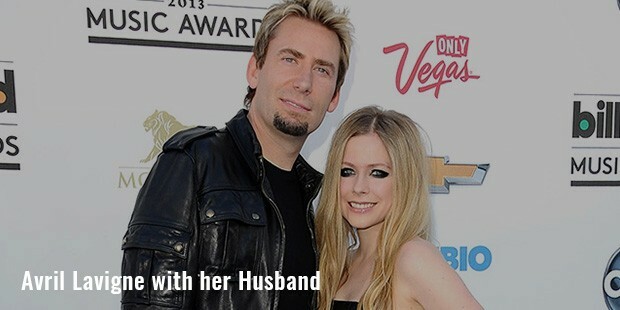 Avril later started dating Chad Kroeger in 2012 and became engaged the same year. The couple married in 2013 but announced separation in 2015.